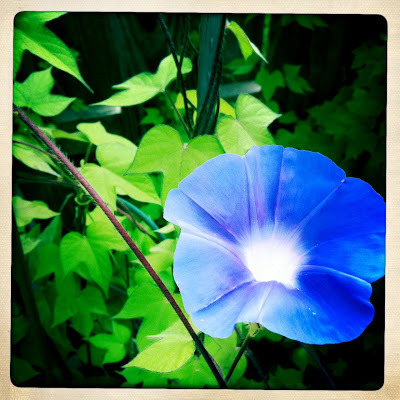 The morning glories are starting to bloom. Here's one from this morning which I risked life and limb, well maybe just limb, to get a photo of. Had to walk around to the backyard in my wedge platforms to get the pic. And there's a bit of a slope in the side yard on the way to the backyard, which I have fallen on, twice within 15 minutes because I was wearing the wrong shoes. But I lived to post this photo! And limbs are in tact.